Are you mystified by matrix reports? Not sure when to use them? As I was learning Salesforce reporting, summary and tabular reports were pretty self explanatory. However matrix reports were a bit of a mystery. I struggled to relate my knowledge of matrices to the data I had at my fingertips in Salesforce. That was until I saw one in use in an another org. Suddenly it all made sense. I was able to quickly go back and solve a lingering problem within our org. First off, when should you use a matrix report? Matrix reports are awesome for looking at groupings of data. You will need to have more than one object included in your report. 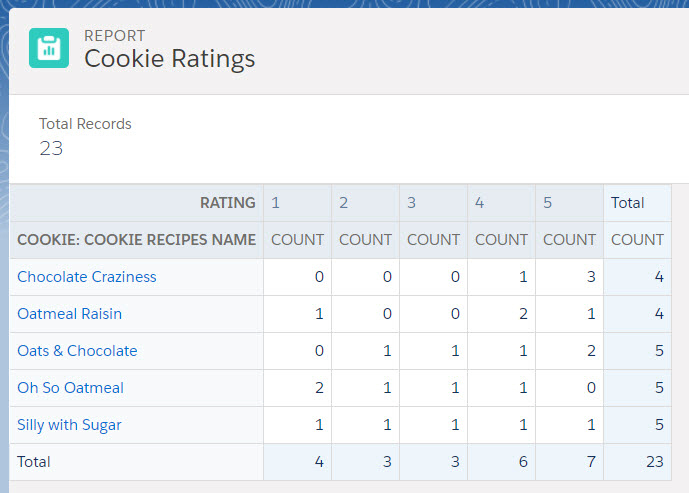 For example, if I am in the cookie business, I may track my the test results of my new cookie recipes in Salesforce. I want to know how many 5 star reviews I have for each type of cookie. Also I want to know how many of recipes with chocolate chips have 4 star reviews. I have 2 objects, Cookies and Cookie Reviews. On the Cookies object I store the information about the recipes. On the Cookie Reviews object I store information about what the individual taster thought. At the moment I am specifically interested in their overall rating. Cookies has a master-detail relation to Cookie Reviews. This is a perfect time to use the matrix report. I can see how many records are in each category. I have put the cookie recipe information on the left as the rows. And I put the information from the Cookie Reviews as the columns. You can have up to two categories to group your rows by but only one column category. The caveat to that is that you can have additional summary information in addition to record count. If on our Cookie Review also included the number of boxes they purchased and the purchase price we could have the sum or averages of each of those by rating. At the same time, we can add in a column that groups by whether the recipe has chocolate chips or not. So we have two recipes with chocolate chips and three without. Looking at our numbers we can now tell that we have sold more of the non-chocolate chip cookies but the cookies with chocolate chips have better ratings with 5 with five stars over 2. Now that we have looked at this fictitious scenario, it’s time for you to start looking at your business. Maybe it’s looking at the number of opportunities by type that are in each stage and summing the expected revenue to see which opportunity types are providing the greatest potential for revenue. Now we can look at how to turn those positive reviews into more sales. Or how about which account types have the most number of opportunities. Salesforce provides some great step by step instructions for creating a matrix report to get you started.